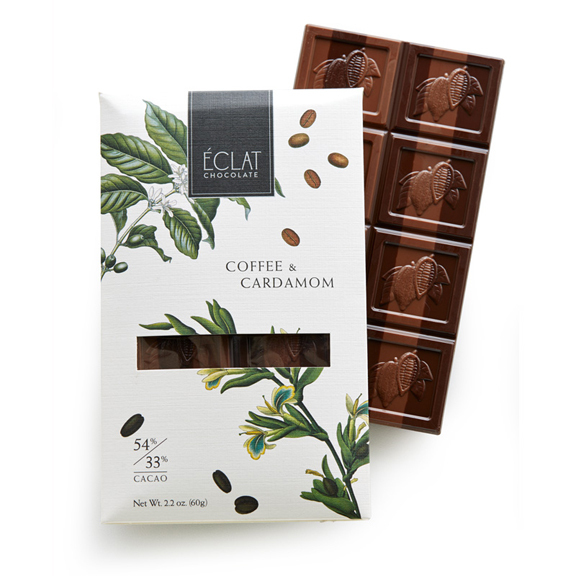 Coffee & Cardamom Chocolate, 2.2 oz / 60 g (Eclat Chocolate) - Penn Herb Co. Ltd. Dark Chocolate (min. cocoa mass 54%, sugar, cocoa butter, soya lecithin, natural vanilla), Milk Chocolate (min. cocoa mass 33%, sugar, cocoa butter, whole milk powder, soya lecithin, natural vanilla), Coffee, Cardamom. Produced in a facility that handles peanuts, tree nuts, milk, wheat and soy.